Youth team Kuzbass won Kosa Mini World Cup on Sunday for the second time in its history so Kemerovo bandy school keeps to hold on the title of the best in the world for 4th consecutive year in a row. In the final match Kuzbass defeated swedish Vetlanda BK in a hard fight 2:1 (0:1). 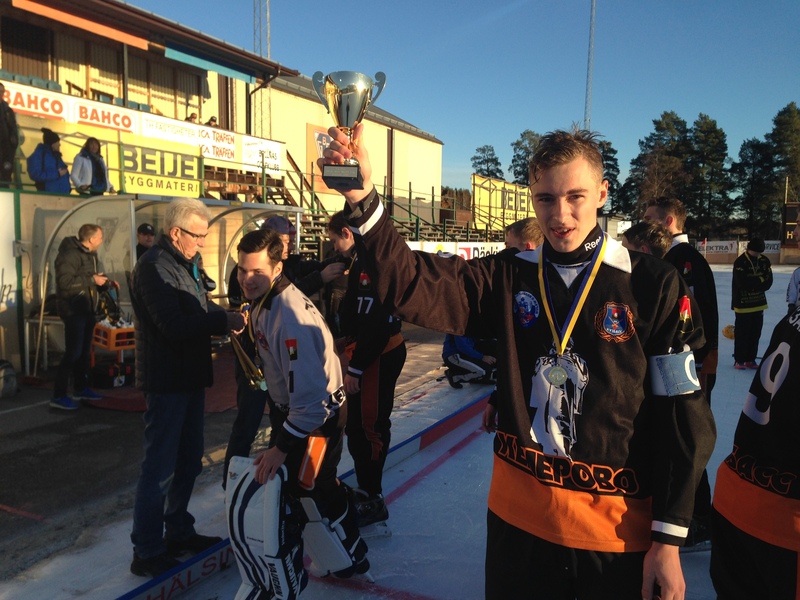 Under the rays of bright sunshine at +12C on the rapidly melting ice of the cult home arena for Bollnäs GIF, Sävstaås IP was hold one of the most exciting finals for the recent years. There are not so many swedish teams can resist to the best representatives of rysskij hockey but Vetlanda managed to do not merely this. It was just one step away from their victory if Vetlanda scored 12-meters penalty shoot at the 2nd half while winning 1:0. It’s unlikely that Kuzbass could find more its strength to save this game on thawed and slow-motion ice. The organizers had to redraw the schedule on the last day because of the vagaries of wind and warm weather which forced to cancel the 3rd place match and play the final immediately after the second semi-final. Thus, this match had to become the 3rd one within 6 hours for both finalists on Sunday. An entry list in this year, with only exception of norwegian teams, was quite smooth while weather conditions have levelled down the benefits in some cases and deprived usual comfort for those teams that trained for the tournament at indoor arenas. Once being found themselves in critical conditions in the open air, not everyone was able to play to their strengths that ensured results on the smooth and fast-speed ice at arenas under the roof. Kuzbass has shown that they can if not everything but very much in bandy. The guys are very well trained at no only boll-technics but have also good skating skills. The tactical range of the team is diverse that surprised most, for example, when Kuzbass performed perfectly high-boll tactics in the semi-final vs Sibselmash at a condition of no-good ice quality while they totally surpassing the others at the play on a bottom floor. The leaders of Kuzbass Artem Azarov and Artem Repjakh possess play-make thinking that is a step ahead of other of their peers as well as the team’s play in general is distinguished with a kind of smart rationalism and versatility. SKA-Neftjanik from Khabarovsk is developed in the same with Kuzbass direction. This team is the most remote participant at Kosa Mini World Cup and their appearance in Bollnäs is the first ever been. The Far-easterns concerned to their tasks very serious and have come to Sweden enough time ahead to keep on a training camp and play a control game against the Cup’s hosts Bollnäs. But they failed to achieve a better result because they were lack of a good luck and a trite experience of playing at the tournaments of such a high level since almost their entire team consists of players aged one year younger. However SKA-Neftjanik has its own distinguishing and well-organized game pattern that brings them among the favorites of the next Kosa Mini. The finnish club PaSa has done a lot of noise at the tournament when came out of their group from the first position while sent SKA-Neftjanik to play their quarter-final with yet another one russian favorite Sibselmash. PaSa deserved to play in the final but missed unfortunately an annoying and crucial goal from Vetlanda for only 20 seconds to the end of their semi-final and lost 0:1. Another one semi-finalist Sibselmash from Novosibirsk had been considered as one of the most vinners at Kosa Mini. This russian club keeps high level but it’s not enough only a good luck to achieve top results. The lack of big ice practice is the main problem for the teams from Novosibirsk, both masters and youths. Therefore their balloon of functionality has begun to deflate exactly to the playoff games besides the team is still not ready yet mentally to resist to such the good team as Kuzbass, so the fight did not happen in the semi-final — 1:7 (1:4). The rest of the teams, with only exception from Norway, were of quite a same class and could get into playoffs with varying degree of a good luck but Kosa Mini World Cup is the fulminant tournament where its natural conditions are close to those to survive in the wild when only an error leads to bad consequences or to result of the strong eats the weak. According to this tradition everything has turned out such this time too, exept perhaps the final game that in contrast to previous years has become an adornment of the tournament.